The Right Way to Lose a War - Audiobook | Listen Instantly! Why has America stopped winning wars? For nearly a century, up until the end of World War II in 1945, America enjoyed a Golden Age of decisive military triumphs. And then suddenly, we stopped winning wars. The decades since have been a Dark Age of failures and stalemates—in Korea, Vietnam, Iraq, and Afghanistan—exposing our inability to change course after battlefield setbacks. 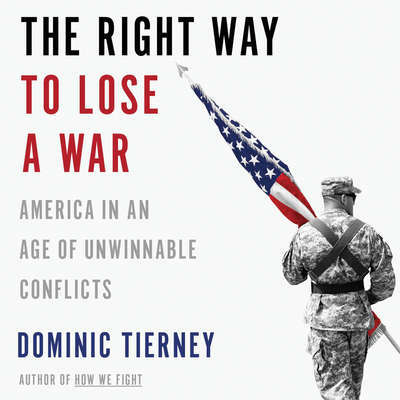 In this provocative book, award-winning scholar Dominic Tierney reveals how the United States has struggled to adapt to the new era of intractable guerrilla conflicts. As a result, most major American wars have turned into military fiascos. And when battlefield disaster strikes, Washington is unable to disengage from the quagmire, with grave consequences for thousands of US troops and our allies. But there is a better way. Drawing on interviews with dozens of top generals and policymakers, Tierney shows how we can use three key steps—surge, talk, and leave—to stem the tide of losses and withdraw from unsuccessful campaigns without compromising our core values and interests. Weaving together compelling stories of military catastrophe and heroism, this is an unprecedented, timely, and essential guidebook for our new era of unwinnable conflicts. The Right Way to Lose a War illuminates not only how Washington can handle the toughest crisis of all—battlefield failure—but also how America can once again return to the path of victory. Brian Troxell is an audiobook narrator and Atlanta-based actor and voice talent who can be seen and heard on television, film, radio, podcasts, and the live stage. He is a regular cast member of the Sketchworks sketch comedy troupe and performs regularly with the Atlanta Radio Theatre Company. He can also be heard as a cast member of the Harry Strange Radio Drama.